Rose: Love Is In The Air! As is the rose that bear Jesu; Alleluia. Is there any other flower that has been heralded as much as the rose? According to Witchipedia, “roses have been cultivated for over 5,000 years. There are 150 natural named species worldwide and thousands more cultivars. The Chinese were the first to cultivate roses and begin hybridizing them.” The rose, which has always been a symbol of love, may be the one flower that transcends all cultural and religious boundaries. It’s magical, medicinal, culinary and decorative uses have been appreciated by just about everyone. If you find someone who hates roses, you might want to keep your distance from them! As a ritual and magical flower, rose petals and rose hips are often used in connection with love and healing spells. Rose water is used in baths to enhance the mood for love. Rose tea is said to enhance prophetic dreams and their scent has a calming effect as well. And let’s not forget how many people send roses to convey love, friendship, sympathy and the like. Christians also have a long association with the rose. 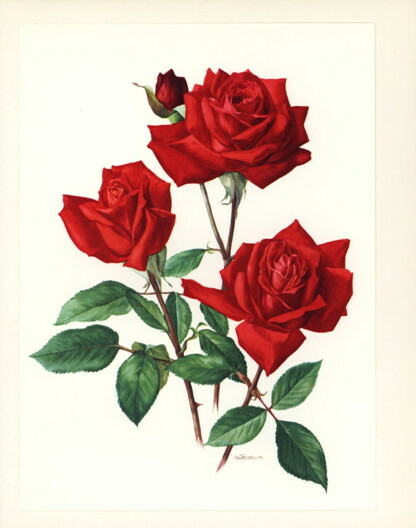 During the Middle Ages the rose was cultivated in monastery gardens and was used for medicinal purposes. Medieval Christians identified the five petals of the wild rose with the five wounds of Christ. The red rose also stood for the blood and suffering of Jesus and was eventually adopted as a symbol of the blood of the Christian martyrs as well. The rose also has a long association with the Virgin Mary, especially a white one which stands for purity, virtue and unselfish love. There is so much more that can be said but there is no doubt that the rose has been a powerful symbol and magical flower for a very long time. Enjoy them! This entry was posted in Herbology and tagged history, magical, Pagan, rose, Spirituality, Wicca. Bookmark the permalink.